The Sithonia peninsula is a green outcrop of Halkidiki. Its position is between Kassandra (west) and Athos (east). The promontory boasts exceptional natural beauty, which is obvious even from afar. But when you get nearer, by BabaSails‘ boat for example, Sithonia becomes mesmerizing. Hence, sailing in the Toroneos Gulf, between Kassandra and Sithonia, combines many pleasures. Make sure to check them out during your Halkidiki holiday. As we begin our sail northward from the southernmost point of West Sithonia, we will admire the Porto Koufo Bay. Since hills surround Porto Koufo, the waters are calm, ensuring ideal conditions for taking photos of the bay. When we pass by the remnants of a Byzantine castle in Toroni, you will see many attractive beaches with clear waters. Destenika and Tristinika will tempt you to plunge into their beautiful waters for sure. The next leg of our sail leaves hilly and rocky areas behind, replacing them with hilly and forested expanses. At some point, we will see Porto Carras, a 5-star resort. Neos Marmaras, though, will be nearby at this point. 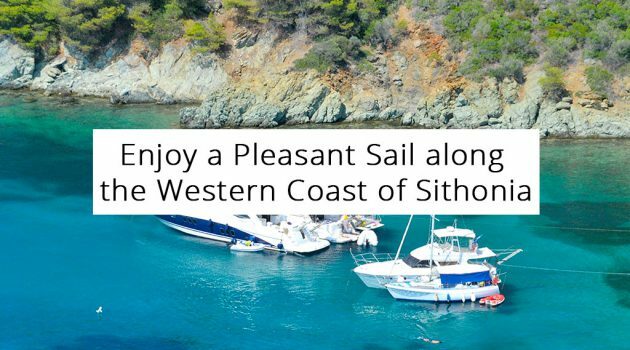 This picturesque settlement of Sithonia boasts great shopping and dining opportunities. There, you can find shops selling garments, delicacies, olive oil, wines and much more. Many restaurants line the waterfront, from where you can enjoy views of Kassandra. Still, the best part of our cruise along the western coast of Sithonia is still ahead. The peninsula has many extraordinary beaches, and we will see some of them between Neos Marmaras and Nikiti. Lagomandra is the first we recommend for a stop. It consists of 2 beaches, in fact. One is ideal for water sports fans, the other for enjoying in peace. Elia beach is as charming as it is narrow, dominated by trees. Spathies Beach comprises 2 beaches, with a hill between them. Both are small, surrounded by lush greenery. Finally, Kalogria beach is another marvelous beach, where we recommend stopping for experiencing sunset.